Feature your logo on the go with this great item! 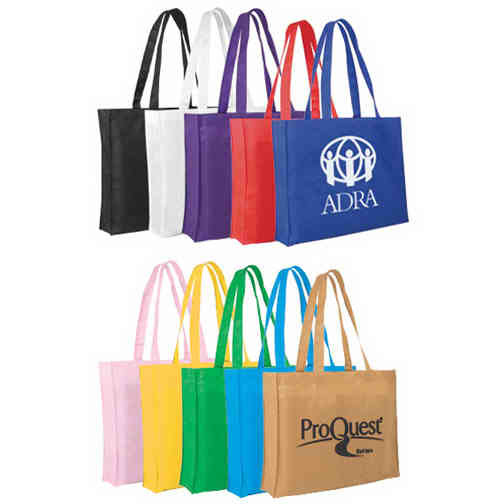 This non-woven polypropylene tote bag has 22" straps. This product features side and bottom gussets and a hemmed opening. This colorful bag is tear resistant, water repellent, and up to 20% reusable/recyclable. Available in a variety of bold colors, select yours today for a fantastic way to promote your business. This product is a great choice for fundraising events. Ideal size. Think Pink. Imprint Size:11" W x 8-1/2" H. Due to material, detailed logos and fine type are not recommended. Screen/Halftones are not recommended. Highest frequency possible is 28 lpi.